I have quite a few recipes that I've formulated to fit the needs of the populations I serve. Most of my clients have health concerns or issues and want to lead healthier lifestyles. I love adapting recipes to make them healthier and taste similar, if not better than before. I am starting to enter food contests in order to showcase my food and maybe make a little money on the side. The month of February has been great for me professionally. I've had lots of catering gigs and cooking classes this month and hopefully March will bring in some of the same if not more. Today I entered a NC Sweet Potato contest. North Carolina is the #1 producer of sweet potatoes in the United States. It's sponsored by Taste of the South Magazine and "frankly, dear, I don't give a damn" about that magazine. I've never read the magazine, but trust you me: I'll subscribe and give gifts to others if I win. 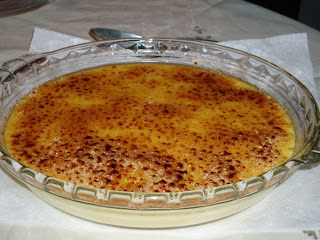 Crème brulee is burnt cream or burnt custard in French. It's an egg enriched emulsion that is covered with a layer of sugar that is burned or caramelized with a kitchen torch (a flame, not a flashlight). The top should not be cooked until black, but until a deep, golden brown occurs. The crust should be crisp and crack when you pierce it with a spoon, knife, fork or weapon of choice. The crème should also be refrigerated before you caramelize because nothing is sadder than finding a weepy room temperature pool of custard underneath the crust. Bleccch! TIP: whenever you burn that roast or pot of beans you tell your significant other "...but baby, it's caramelized." 1. POUR milk and half-and-half into medium bowl. 2. Add dry pudding mixes. Beat with wire whisk 2 min. or until well blended. 3. POUR into 1-qt. shallow baking dish. Refrigerate 15 min. Whisk in sweet potato. 4. Fold in cinnamon, cardamom, and orange zest. 5. PREHEAT broiler. Blend both sugars together in a small cup or bowl. Sprinkle pudding mixture with brown sugar blend. Broil 3 inches from heat, 3 to 5 min. or until sugar is melted and caramelized. Serve immediately. Refrigerate leftovers. See that spoon behind the dish? That was my weapon of choice. Please know that I destroyed this dessert with it. Yum! This is how I do my sweet potatoes for the holidays (I make custard, but same concept). I love the cinnamon and cardamom, too. Makes it taste like creamy chai. What a different take on a classic. The addition of sweet potato is very creative. In South Africa sweet potato is used almost exclusively as a savoury vegetable dish. I have never even eaten sweet potato pie! I am going to plan a visit State side and experience the good life. Heather: that is super cool you do the same thing! I think I might add finely ground black pepper or cayenne next time I make this at home to really get it to taste like chai. Rose: I met someone late last week who told me the same about how sweet potatoes are prepared in Australia. I'm just going to have to give you a recipe for sweet potato pie so you can recreate it at home. Are you interested?